Thank you to everyone who stopped by last Thursday to share ideas for topics for my new linky party. 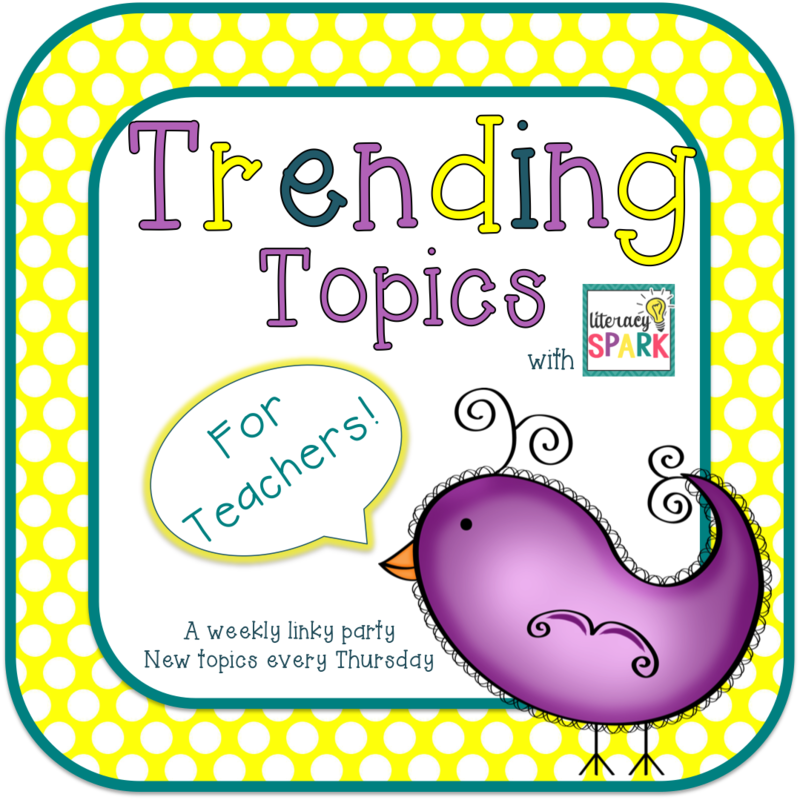 As a reminder, there will be a new trending topic each Thursday. You can come back and link up any time before the following Thursday. And feel free to suggest a topic at any time! 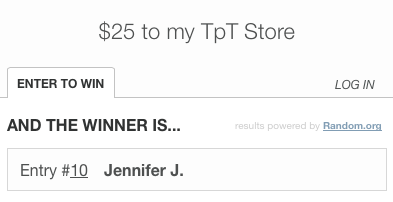 I also held a $25 giveaway to my store last week. The winner is Jennifer J. from Elementary School Garden. Congrats! 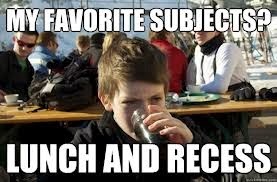 At my current school, students have lunch for 30 minutes followed by recess for 30 minutes. Teachers are partnered up and alternate doing the lunch/recess duties. So one week I have lunch duty and the following week I have recess duty. Personally, I know the kids need recess, but I also don't like giving up the time! I sort of wish it was just 20 minutes, but then the teacher's would only have a 20 minute lunch (which would turn into 10...) so I guess that's part of the reason for having a full 30 minutes. No one says anything to us about taking away recess, so it's really up to the teacher. There are parents parents who will ask for their students not to have recess, either because they are behind or do not behave. But, for that to happen, the teacher having lunch would have to stay with them. Often, we will have kids sitting out for 5-10 minutes of the 30 minutes as a consequence. I don't really like taking away the entire recess because it is more of a punishment for myself since they need the break. But sometimes, I will keep kids inside during recess to catch them up, complete missing work, or test them (like when we were doing DRA). This is really just because there isn't any other time to get it done. But doing so means that I do this during my lunch time. I do feel badly (sometimes) for making kids miss recess to do work...but at the same time they need to learn to be responsible. If missing recess doesn't help I do not keep taking it away from the same kids, at least not more than 5-10 minutes. Unfortunately, there really aren't any other consequences that can be given in school! I'm also likely to have kids do unfinished work during station time and this seems to affect them more. When I taught in Connecticut, we only had recess for 20 minutes, but we weren't allowed to take it away from kids. Instead, if they were being punished, they had to walk laps around the playground instead of sit so they still got their exercise. In TX, 40 degrees is cold, so if it's under 50 we stay inside (I know, pathetic!). Since teachers watch two classes during recess, playing games and having stations really isn't an option because there are just too many kids. So we usually show movies. I have also used Adventure to Fitness, which is pretty cool. The kids love it and think it is a lot of fun. I think some learning might occur during it as well! The site has exercise videos with different themes, so the students feel like they are running up the side of a volcano and stuff like that. You have to register, but it is free. 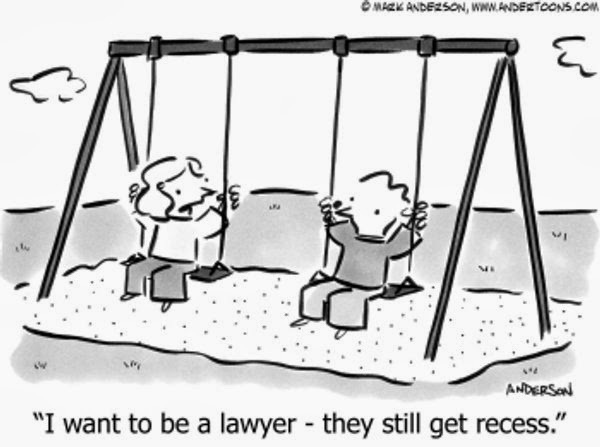 Do you have recess at your school? For how long? Are you allowed to take it away for a consequence? Link up this week and share your thoughts! An interesting topic to discuss! I personally think recess is important for kids of all ages! Also, LOVE your blog design! I have had my eye on Designs by Kassie for a little while, dreaming of a new blog design by her! Interesting . . . We have am recess for 20 minutes (10-10:20) and lunch recess after the students eat lunch. They usually have about 15 minutes to play. Teachers get a 30 minute duty-free lunch. We have yard duty that manage the students at lunch. It's part of our contract to have a duty-free lunch. But, we do have recess or before school-duty every-other week. Thanks for linky. I am with you on not going out unless its at least 40 degrees! Way too cold!!! I also agree about taking recess, we don't have any other consequences these days. If I had an assistant, I would certainly keep students in if their work wasn't finished... at least for half of the recess. We have lunch duty, morning duty, after school duty and recess duty so no free time to help them catch up, it is pretty much the students responsibility. We have a 20 minute recess. We can take the recess for behavior or to work on skills if needed. Usually if it is behavior related, they have to walk so they can still get their exercise. We try to only take half of their recess if they need extra work on something. We have a PE teacher and aide that do recess. We do not have recess or lunch duty only bus, car, or late duty. We had a 15 minute recess, per our principal. We took recess away if students had missing homework or classwork - they completed it at recess and then played. We have lunch and recess day every day.